Dining Area, Living Room all Big Open Space, TV, and Big Opening to Kitchen. Seating Area on House Deck with Beautiful Views of the Gulf. 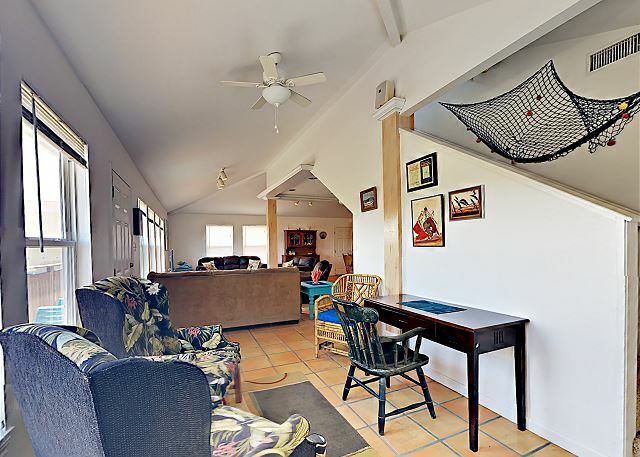 Large Beach House; Boardwalk to the beach; sleeps 9; 3 Bedrooms and 3 Baths. ( BR1-King, BR2-Queen and BR3- 3 Twins); Sleeper Sofa. Has Wifi. 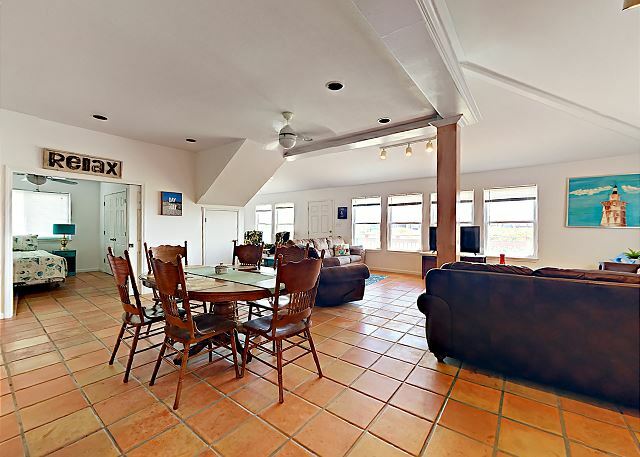 (Dogs Allowed) Deck with lots of seating outside to enjoy the salt air and view of the gulf. 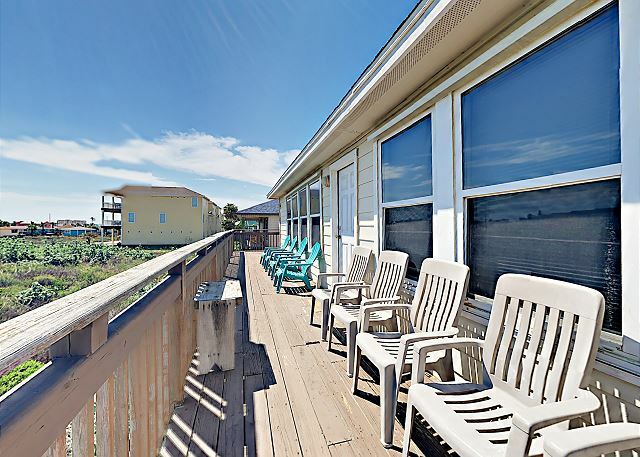 Gulf View From Deck Large Beach House; Boardwalk to the beach; sleeps 9; 3 Bedrooms and 3 Baths. ( BR1-King, BR2-Queen and BR3- 3 Twins); Sleeper Sofa. Has Wifi. 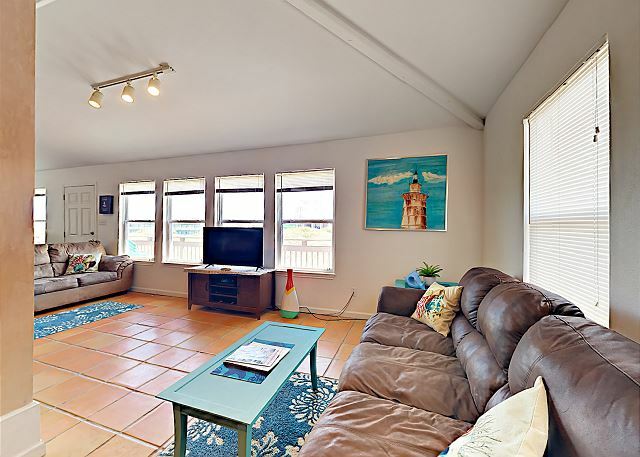 (Dogs Allowed) Large Beach House; Boardwalk to the beach; sleeps 9; 3 Bedrooms and 3 Baths. ( BR1-King, BR2-Queen and BR3- 3 Twins); Sleeper Sofa. Has Wifi. 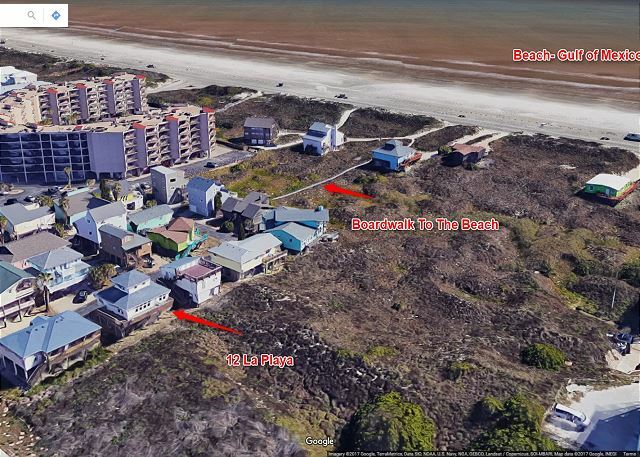 (Dogs Allowed) Very large Beach House; Boardwalk to the beach; sleeps 9; 3 Bedrooms and 3 Baths. ( BR1-King, BR2-Queen and BR3- 3 Twins); Sleeper Sofa. Has Wifi. (Dogs Allowed) Spacious living room and dining area all open space concept. Sleeps 9; 3 Bedrooms and 3 Baths. ( BR1-King, BR2-Queen and BR3- 3 Twins); Sleeper Sofa. Has Wifi. (Dogs Allowed) Living room and dining area all open space concept. Sleeps 9; 3 Bedrooms and 3 Baths. ( BR1-King, BR2-Queen and BR3- 3 Twins); Sleeper Sofa. Has Wifi. (Dogs Allowed) Full Kitchen, Refrigerator, Coffee Maker, Microwave, Cookware, Dishwasher, and Bar Stools. 6 Chair Dining Table, Bar Stools. Living Area and Dining all space. 6 Chair Dining Table, Bar Stools. Living Area and Dining all space. Living Room and Dining all Large Open Space. 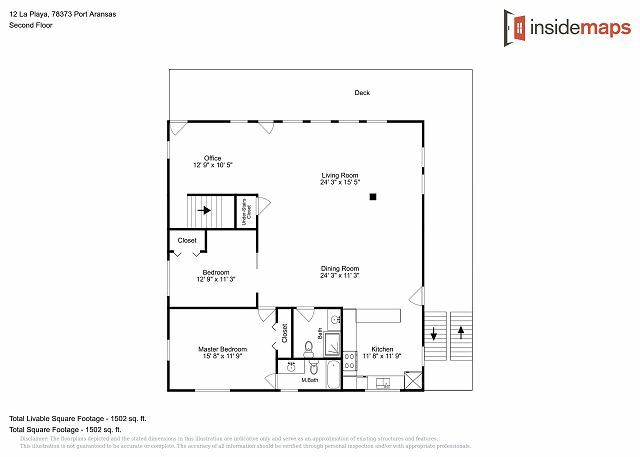 Extra Living Space, Desk and Stairwell. King Size Bed, TV, Private Bathroom. King Size Bed, TV, Private Bathroom. Full Bath, Tub and Shower, Soap, Facial Towelette Cleaner, Shampoo/Conditioner, and Body Lotion. Queen Size Bed. 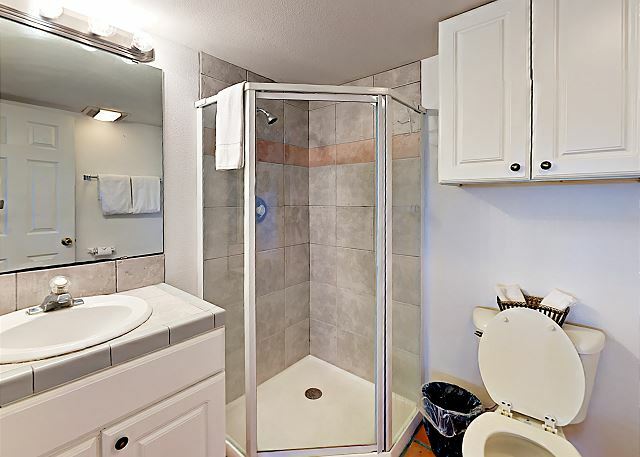 Guest Bath Room, Shower Only. 3rd Guest Room Upstairs, 3 Twin Size Beds. Full Bath Upstairs Shower Only. Full Bath Room, Shower Only, Facial Cleansing Towelettes, Shampoo/Conditioner, Soap and Body Lotion. 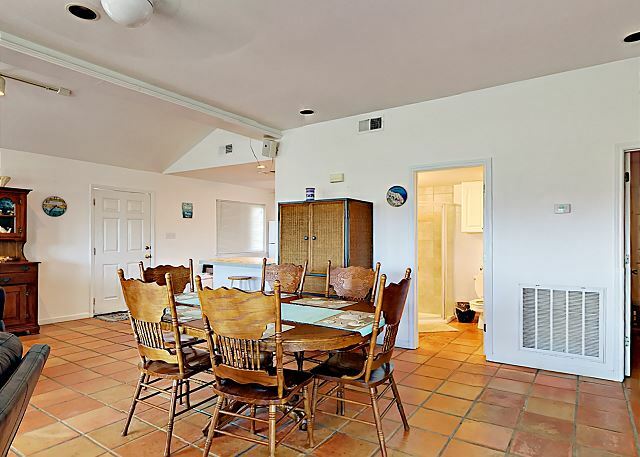 This large 3 bedroom property with an open floor plan is located in the La Playa neighborhood of Port Aransas. 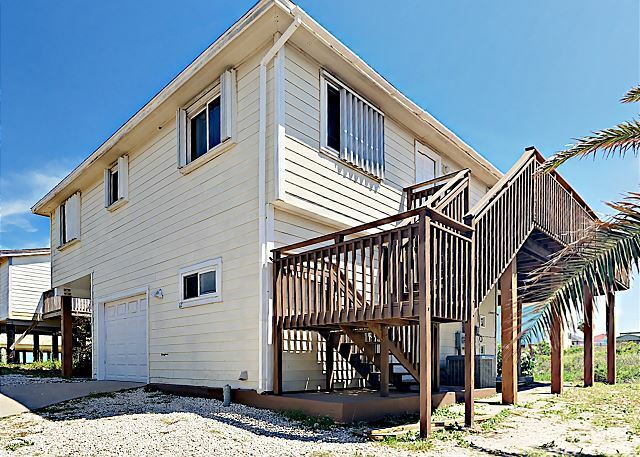 This is one of the closest neighborhoods to the beach and has a nice boardwalk for access to the beach There is a large, open, living with sleeper sofa, dining, and kitchen area. 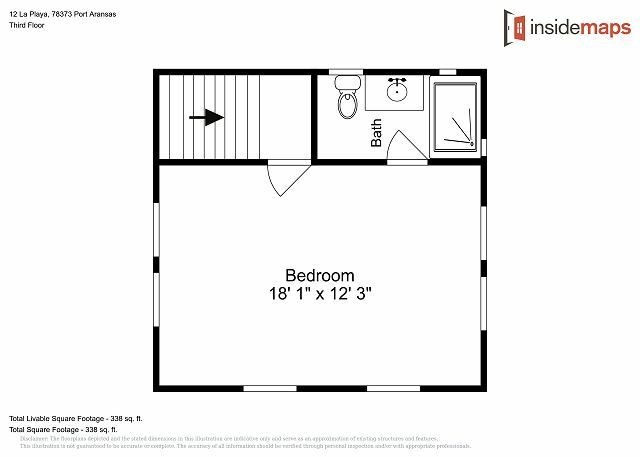 Two Bedrooms & 2 baths are on the 2nd floor and 3rd Floor has a bedroom and bath. 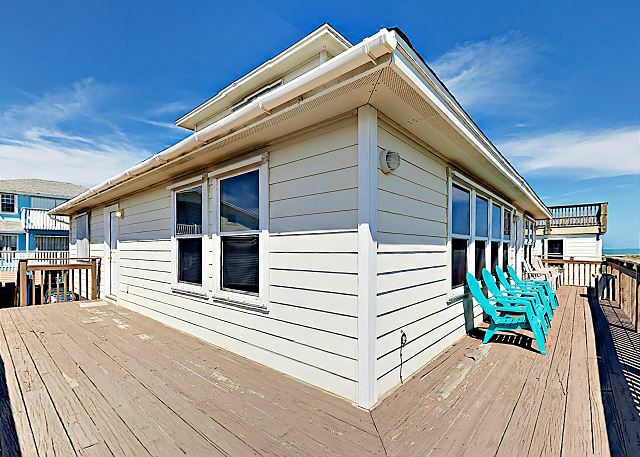 The property has a view of the ocean from the L shaped deck located on 2nd floor. Enjoy your fresh catch on the charcoal grill. Beach decor can be found throughout the home. 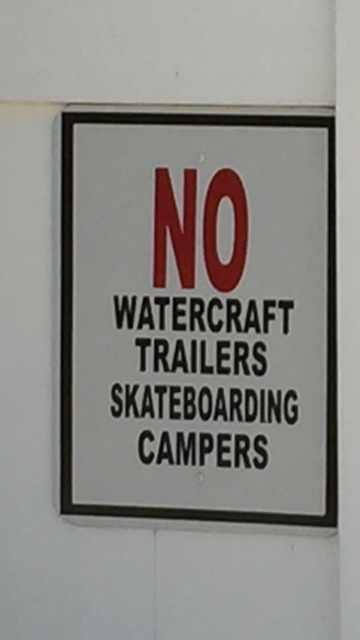 NO Boat or Trailer Parking on streets. Boats allowed as long as parked in Driveway. Thank you for staying with us, please come again soon! We had a great time during our stay. 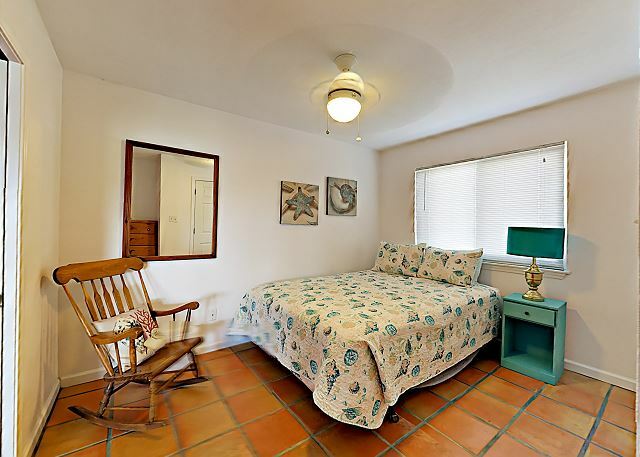 Plenty of space for guests, dog friendly, and a short walk to the beach. We found the property to be clean, well-stocked, and better than other rental houses we’ve stayed at in the past . Will definitely book again for our next Port A trip! We are so happy to hear that you had a great stay. Please stay with us again! Thank you for the review. This was exactly what we were looking for. 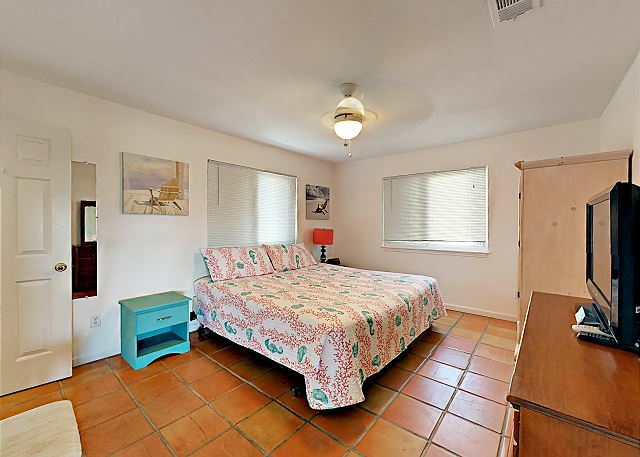 Three bedrooms and baths with enough room to enjoy and walking distance to the beach. Thank you for staying with us, come again soon! The houses were great. However, we were not provided the paper goods that were promised or the grill that was promised. The floors were disgusting, definitely not cleaned at all. Everything else okay. Thank you for staying with us at Life In Paradise at 12 La Playa. We provide toilet paper, paper towels & trash bags. If you ran out we would have been happy to give you more. The grill is located on the small concrete patio on the bottom. 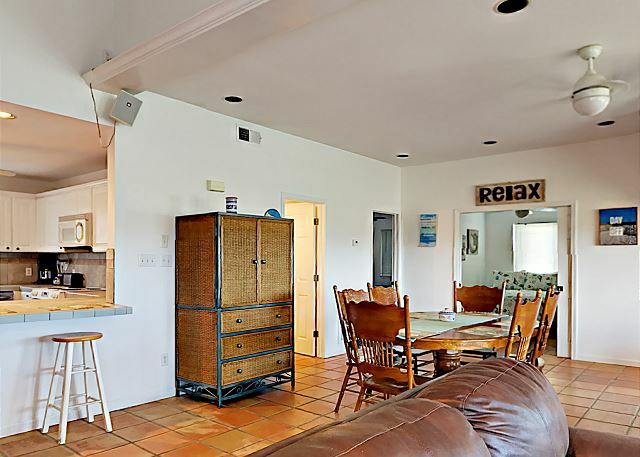 We do clean the floors, but with the house being so close to the beach, every time the doors are opened sand blows in. Have a great day! We are a family that comes to PA every year and have for well over 30 yrs. We usually stay in a condo but our favorite one has not reopened since Harvey. We decided to rent a house and Life in Paradise was recommended to us as a good company to work with. We were more than pleased with the property and the rental company. We will rent with them again. Next time we might get in a house with pool in the complex. We did miss that but the beach access was excellent. We had our adult sons and a daughter-n-law with us and the house was large and very comfortable. Loved the deck mornings and evenings! Thank you for your review, we value your input. We are so happy to hear that you enjoyed your stay with us. We hope to have you again soon! We loved it, perfect locations and very comfortable for a big family, we will be making a annual visit for sure! Thank you for your review. We are happy to hear that you had a great visit. We hope to have you again soon! 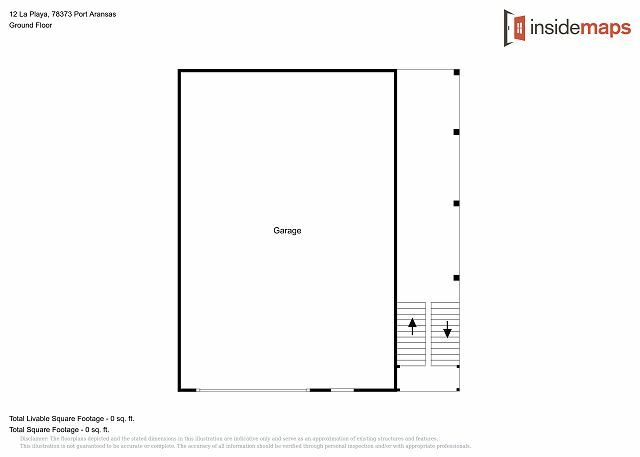 The location of this property is ideal. 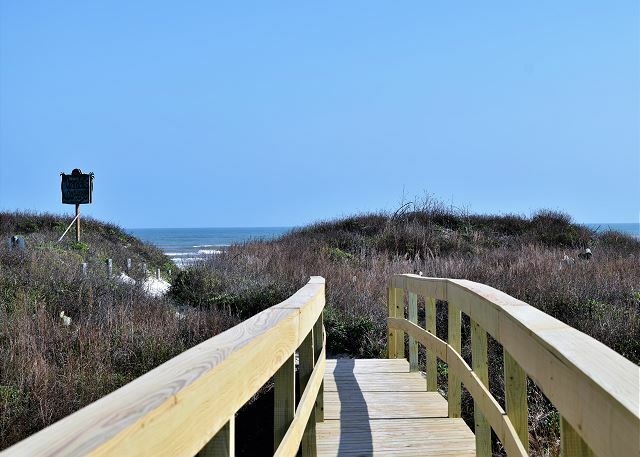 Beach access is an easy 5-7 minute walk. Very spacious for our family. The management company was very easy to work wih. We will stay here again! 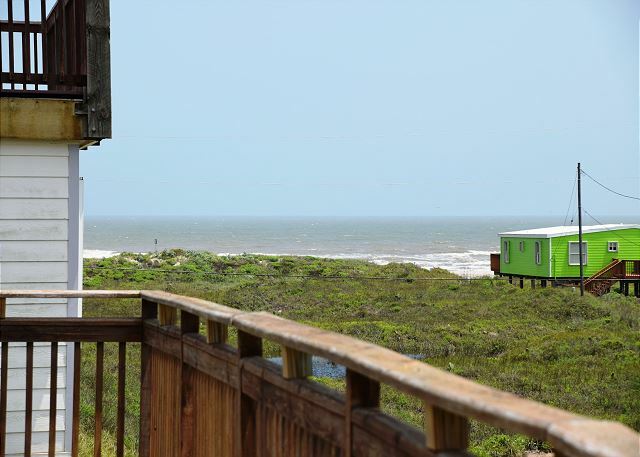 Thank you for submitting your review for 12 La Playa, we are glad to hear you enjoyed your trip, we agree that the house sits real close to the boardwalk and is a great spot in Port A, come back and see us anytime! Mostly an excellent stay. Evidence of repairs from hurricane damage, but could have used more. Deck needs work. Mattresses werent comfortable. Stove should probably be replaced. Burners didnt fit right. However, 7 of us were comfortable and enjoyed the house. Short walk on repaired boardwalk to one of the best beaches Ive ever seen. This was a nice getaway place, very roomy, and we had plenty of room for my son to run around and play. Water heater broke but they had someone out fixing it within a few hours! They went above and beyond to make sure we were comfortable. 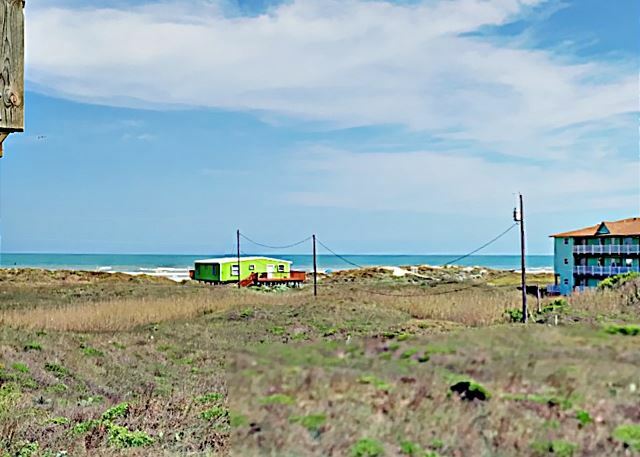 This property is a good location-close to the beach. You can sit on the deck and watch the ocean. Access to the beach is close. Facilities are adequate, however there are some things that need to be fixed in the property. Love being so close to the ocean, the view is great. Nice to be able to hear the surf rolling in. 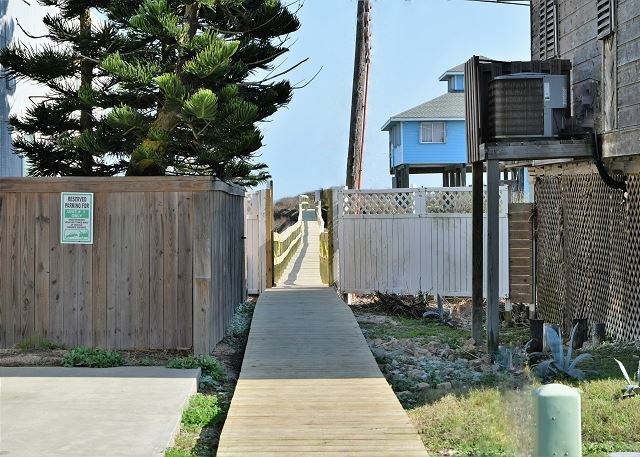 The walkway to the beach is brand new. Good internet wifi, and nice new tv with Directv service. Plenty of room, with big open concept. We're coming back next year. 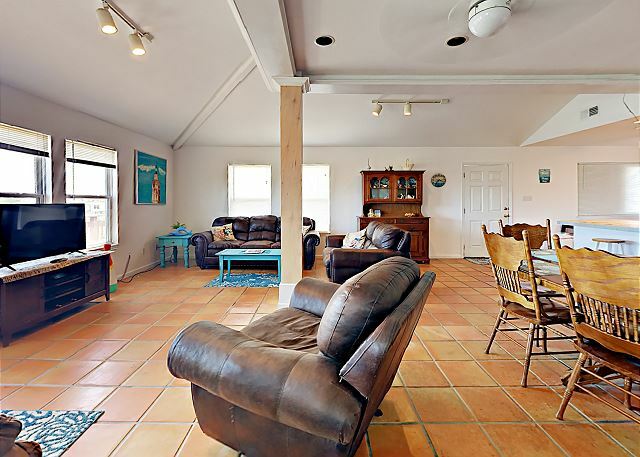 This beach home at first appears a little rustic, but everything proved to be family friendly and very comfortable. It has a large living-dining room with two large sleeper couches and other seating,and a desk. The wifi works well and the TV has enough channels to keep the family happy. The Mexican tile floors are worry free if sand is brought in and easy to maintain. Over all this is a very quiet location 5 minutes walk to the beach. Once on the beach you can walk miles in rather direction and see and do many interesting. 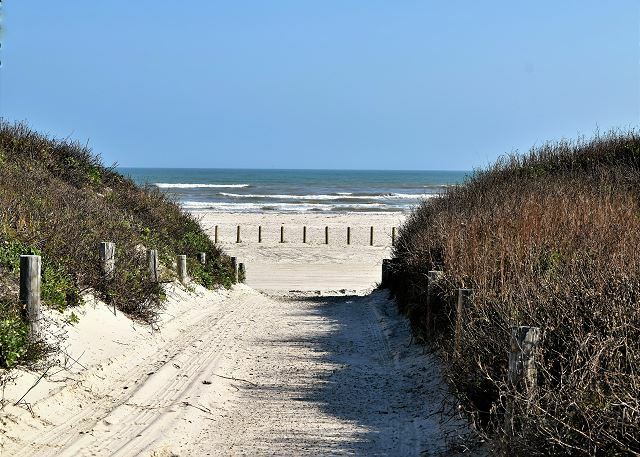 The surf is safe for the family and the sand beach is 100 feet or so wide, and you can fish of the beach or off a pier or of the famous rock jetty just 2 miles away. We really enjoyed our month stay there and highly recommend it. This rental had more than enough room for our family of 7. Perfect space for my group! Open floorplan on the main floor with plenty of space to spread out. Great view from the patio. We loved being able to walk to the beach and took full advantage of this. We also really enjoyed the full kitchen, we didn't have to go out to eat once while there because we cooked all of our own meals. Hello, Thank you for the review. 2 La Playa is in a great location. Glad you enjoyed your stay. Look forward to seeing you again. Follow us on facebook for future specials. Hello, Thank you for the review. 12 La Playa is in a great location. Look forward to seeing you again. Follow us on facebook for future specials. Second year here and really enjoyed it. 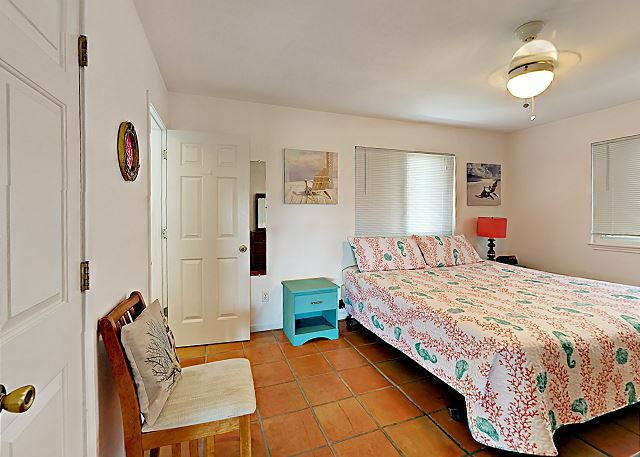 Close to the beach, shopping, and restaurants. 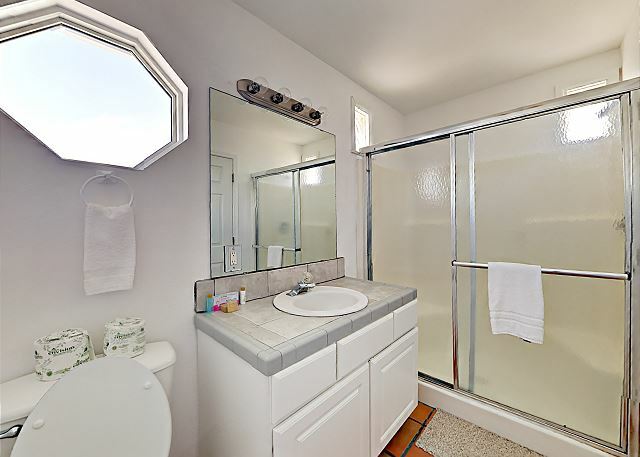 Off the main streets that gives a little privacy. The house was clean and spacious with a great view of the ocean off the deck. We were able to accommodate surprise guests that came down for a long weekend. We would love to rent for 2017 but it is already taken. We will be back hopefully in 2018. Hello, Thank you for the review. Glad you like the house. We do have other houses you can choise from for 2017. Look forward to seeing you again. Follow us on facebook for future specials. Great location, steps from the beach. 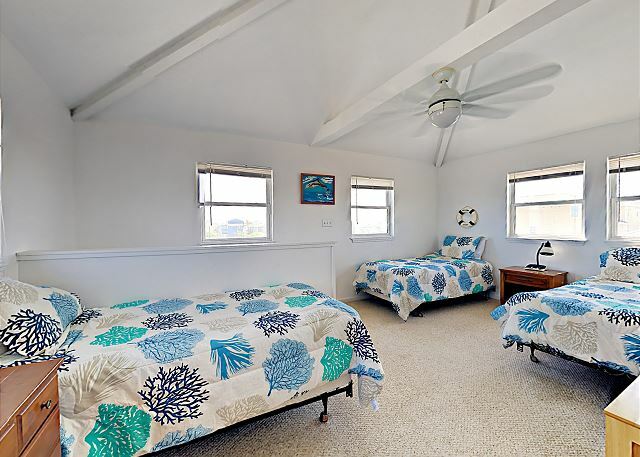 The house is perfect for a large family, plents of beds, three full bathrooms, beach view. The only complaint is the house could use some tlc. Would like it to have a fresh coat of paint inside and replace the furniture. Some of the appliances need attention. Overall a great place to stay. Hi Jo Ann, Thanks for the review. Glad you enjoyed the vacation. This house is in a great location. We will let the owner know it needs attention. Hope to see you again soon. Follow us on face book for specials. we really enjoyed this place. It is literally 100 yards from the beach. The common area easily accommodated 7 people. The deck has a nice view and the master is really nice. We would definitely stay here again. Hello, thank yo for the review. This house is a great price for the size and location. Look forward to seeing you again. Follow us on facebook for specials. Clean, Quiet and Near the Beach! It was a crowded Memorial Day weekend and the houses are somewhat close together but we had no issues with privacy and quiet. 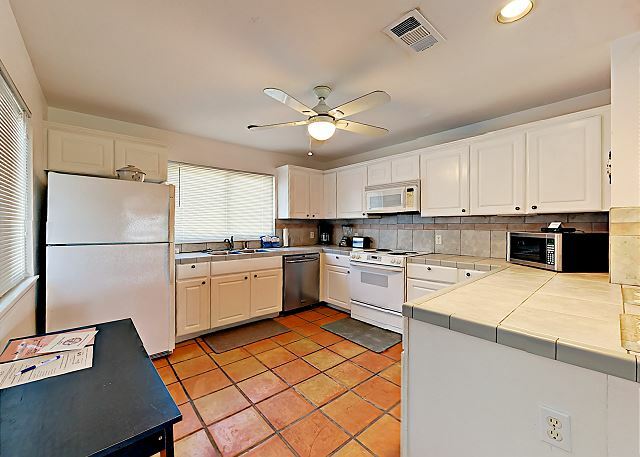 The house is spacious and clean and kitchen is well furbished. My only gripe and it's pretty petty is the little teeny soaps in the bathrooms and as another guest mentioned, the white rocks that you have to walk over are a nuisance but we got used to them. Hello, Thank you for your review. We are glad you enjoyed your stay. Hope to see you again. We loved it. It was like home away from home. We are most definitely looking forward to going back soon. The rental was everything we expected. Hello, Thank you for the review. We are glad you enjoyed your stay and look forward to seeing you again. The house was exactly what I was looking for. The only reason I didn't give it 5 stars all the way through was because it was as expected and it didn't exceed my expectations. The inside was very spacious and clean. Hello, we are glad you enjoyed your stay. hope to see you again. We had a good stay with plenty to do in Port Aransas. Home has a great location with a view. They need to fix the two main burners on the stove top otherwise a nice vacation rental, we would rent this home again. Hello, we are glad you enjoyed your stay and look forward to seeing you next year. The stove will get fixed. The house was great for our relaxing trip. Four adults and two teenagers enjoyed it very much. Hello, Glad you enjoyed your vacation. Hope to see you again. We had a small group of friends join us and the accomodations were perfect for our needs. There is a nice boardwalk a few houses away that leads to the beach and a view of the ocean from the deck. The only real issue for us were the white rocks you have to walk on to get from the house to the street. My car almost got stuck in them as well. We are so glad you enjoyed your stay.. The Rock was just layed and has not settled fully yet.. Look forward to seeing you in the future..
We spent Jan/Feb 2014 at this rental. We love Port Aransas! This was our first time to the island and we love the community. As for the house, the space is wonderful, including great living room furniture and master bedroom mattress. We enjoyed the short walk to the beach--4 times per day because of two dachshunds. 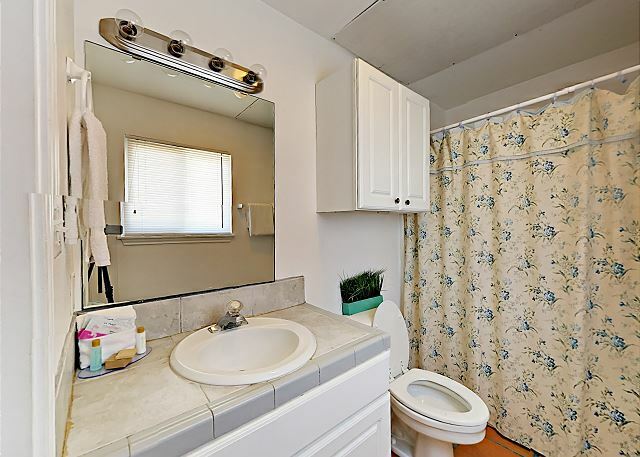 The only downside is the interior needs paint, new carpeting in the upstairs bedroom, paint exterior doors, and maybe new stove burners and drip plates--it needs "staging". The most negative to us are the pavers outside and is the reason we did not rebook at this location for next year. If they replace the pavers with cement, we would be back! Did I mention we love Port Aransas!! 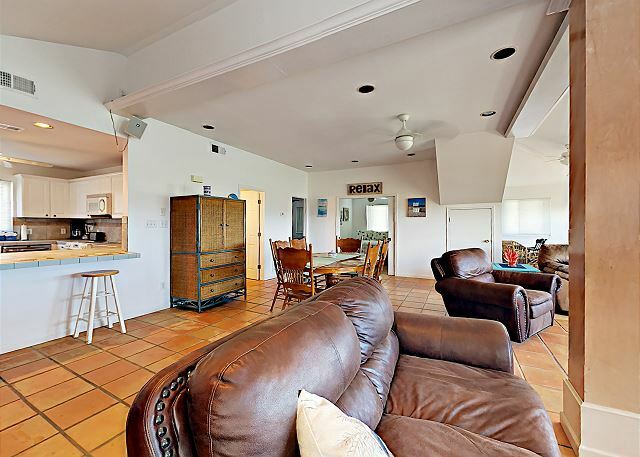 I am very glad you enjoyed your stay at Port Aransas and at # 12 La Playa. Thank you for taking the time to write the review and bring the issues above to my attention. As homeowner, it is of vital importance to me renters are happy. I looked at the issues closely; they will be addressed one by one according to priorities and funds available. Already,with the assistance of Life In Paradise, we are taking steps to replace the pavers with cement. We love to have you again and hope you will again rent #12 and enjoy your stay there.